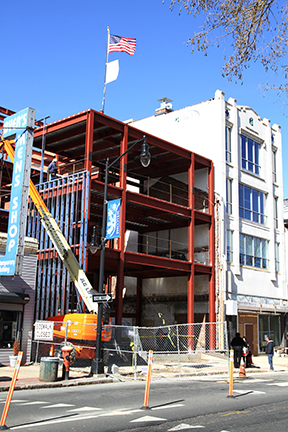 WEST WINDSOR – Mercer County Community College (MCCC) reached a major milestone toward the completion of a new high-tech education facility in downtown Trenton, with the placement of the final steel beam in the crown of the Trenton Hall Annex today. The beam is the last piece of structural steelwork in the three-story, 8,500-square-foot Trenton Hall Annex, on MCCC’s James Kerney Campus (JKC) in Trenton. 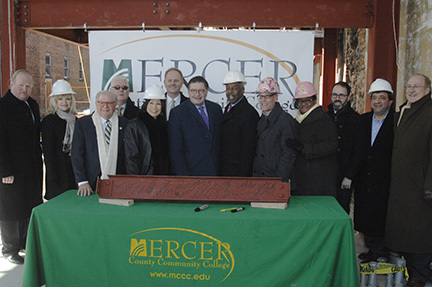 Participants in the ceremonial signing of the beam included Mercer County Executive Brian Hughes, Trenton Mayor Eric Jackson, Mercer County Freeholder Pasquale “Pat” Colavita, MCCC Board of Trustees Chair Mark Matzen, and Dr. Jianping Wang, MCCC president. Dr. Wang said the new building is a demonstration of MCCC’s commitment to Trenton, and the expansion of educational opportunities in the city. Located at 137 North Broad Street, anticipated completion date for the Trenton Hall Annex is August. The building will house the college’s new programs in Security Systems Technology, Cyber Security, and existing classes in Certified Nurse Assistant, Phlebotomy, and EKG. In addition to academic spaces, the ground floor will house an art gallery, made possible by a generous gift from Investor’s Bank, in partnership with the Roma Bank Foundation. The gallery will display the work of students and local artists, and will be available for a variety of college and community activities. Total cost of the project is $5.9 million, which includes demolition of the building previously on the site and renovations to the adjacent Trenton Hall. Funding for the project was made possible by the Building Our Future Bond Act, passed by voters in 2012. Matzen noted that the MCCC Board of Trustees adopted a comprehensive facilities master plan in 2010, which includes a substantial investment in the James Kerney Campus in Trenton. MCCC President Dr. Jianping Wang invites Trenton Mayor Eric Jackson to sign the final beam of the Trenton Hall Annex, as MCCC Board of Trustees Chair Mark Matzen looks on. 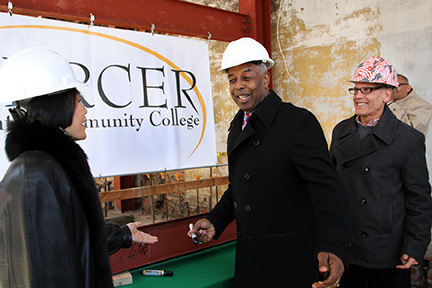 Mercer County Executive Brian Hughes (center) takes his turn signing the final beam for the Trenton Hall Annex, as MCCC President Dr. Jianping Wang (left) and MCCC Board of Trustees Chair Mark Matzen (right) look on. Guests participating in the signing ceremony of the final beam for MCCC's Trenton Hall Annex, from left: Leon Jones, Local 5 Bricklayers Union; Jeri Bogan-Zielinski, chair of the MCCC Foundation Board of Directors; Mercer County Freeholder Pasquale "Pat" Colavita; Chuddy Whalen, Local 9 Plumbers and Pipefitters; MCCC President Dr. Jianping Wang; New Jersey Assemblyman Wayne DeAngelo; Mercer County Executive Brian Hughes; Trenton Mayor Eric Jackson; MCCC Board of Trustees Chair Mark Matzen; MCCC Trenton Campus Provost Monica Weaver; Michael Nelson, Clarke Caton Hintz; Anthony Verrelli, Local 254 Carpenters Union; and Robert Di Falco, member of the MCCC Board of Trustees. The flag now flies atop the newly-completed steel structure of the Mercer County Community College Trenton Hall Annex in downtown Trenton.